CSS Virginia Plans - Download a pdf Plan of the Confederate Ironclad! CSS Virginia Plans - a plan of the Ironclad rebuilt from the steam frigate USS Merrimack. Download a PDF plan suitable for scratch-building a model of the first Confederate Ironclad. The plan is available in these scales: 1:48, 1:72 or 1:96 in a single download. Preview of the CSS Virginia plans. The actual plans are high-resolution PDF files. To give you an idea of the size of these CSS Virginia plans, and the size and weight of the model that would be built from them, here is a run-down. I've used approximate dimensions here, because the purpose is just to give you an idea of the size car or truck you'll need to move it, or the size mantle over your fireplace. If you are thinking of building an RC model, the displacement converts to about 84 pounds (37 kilograms). To move at "scale speed", you'll need about 8W of power at the propeller shaft. Take this as a ballpark-figure since drive-train and propeller efficiency can vary substantially between full-scale and models. Hopefully this will help deciding how big a model boat you want to build, and which set of CSS Virginia plans to work from. 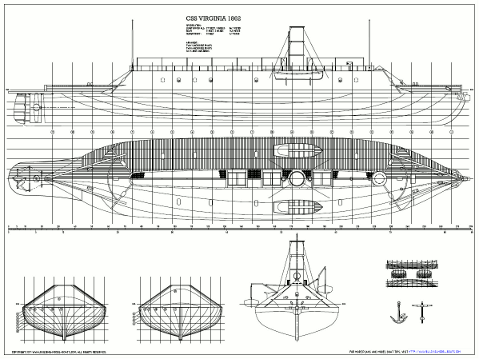 When I did the research for the CSS Virginia plans I found there is an almost overwhelming amount of documentation for this vessel. Most surviving plans are from the hand of John L. Porter - the Naval Constructor responsible for much of her design. Some detailed sketches and narratives exist from eye witnesses, including crew members. Some sketches of varying quality and detail have also survived from diaries and correspondence by John M. Brooke who was assigned to develop the ordinance and design the casemate on the ship. Much of the development of the ship was a collaborative effort between Porter and Brooke. In addition Chief-Engineer William P. Williamson was responsible for the salvage and resurrection of her faulty machinery. Ultimate decisions were made by the Secretary of the Navy of the Confederate States - Stephen R. Mallory. Much of the surviving documentation is correspondence and notes that Porter and Brooke wrote after the war in their ongoing argument as to whom could lay claim to the ship's design. Unfortunately, there are no surviving photographs. In my research, I found the two models at the Hampton Roads Naval Museum and the one at the Marines' Museum very intriguing. They are both very well researched, yet so different. For pictures of the CSS Virginia models - follow the link (will open in a new window). The model at the Mariners' was built in the 1930's and correspond well with how we're used to see the Virginia. I suspect largely because this model has been copied over and over. It has some design solutions that I would consider peculiar. Mainly because those solutions seems impractical from a point of good seamanship or shows a lack in protection - something I'm positive Lt. Brooke would have strongly objected to. The other model, at the Hampton Roads Naval Museum seems to be made more recently. The builder seems to have focused more on practical handling, protection and good seamanship when working out the finishing details. As a result the issues above have been addressed and solved on the model. As I worked my way through the material, I found that the latter makes more sense. What you'll see is that the plans offered here follow the appearance of the latter model more closely. The Confederate Navy - Catalog of an exhibition at The Museum of the Confederacy, Richmond, Virginia - on display March 8, 2005 through December 31, 2006.